Try to remember the last time you walked into a brick & mortar store. Most likely, after a few minutes, someone stepped up to you and asked you if you needed help. Then they asked you what you are looking for, and tried to find the best fitting product for you. Now, can you recall a moment when this happened to you during an online shopping experience? If you’re finding it hard to remember more than a handful of sites you noticed this on, don’t worry – you’re not alone. In a recent study by Deloitte and ExactTarget, 50% of CMOs said they will soon implement personalization strategies on their stores. The reality is, real e-commerce personalization has been quite hard to achieve in the past. However with new technologies and innovative startups, you now have a lot of options to choose from. In this post I’ll try and review the different personalization opportunities, dive into some use cases and explain why each is worth exploring. 1. Cater to your customers’ specific product preferences. Let’s start with what might just be the easiest trick to implement. Personalized recommendations are product recommendations like the ones pioneered by Amazon.com, see my screenshot below. The idea behind this type of recommendation is to cross-sell (“need a memory card for that camera?) or up-sell (“Why not buy the fancier model? Better sensor, better lens.”) based on your customer’s interests, or the behaviour of similar customers. 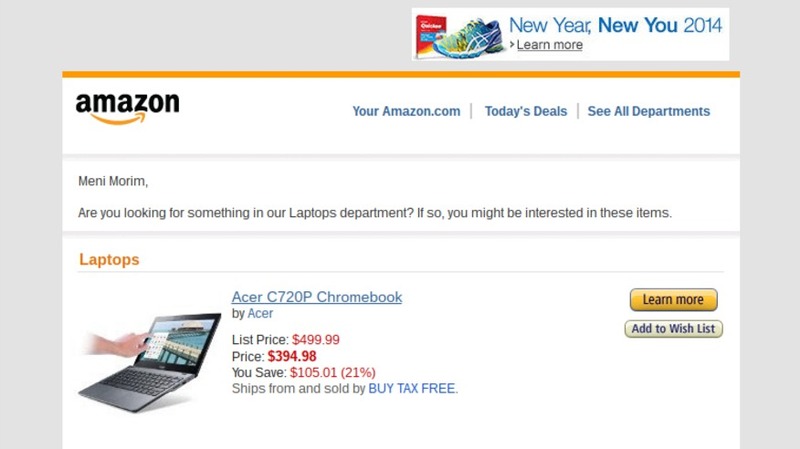 In fact, 70% of Amazon’s homepage is dedicated to product recommendations. Studies and research done by Forrester and Gartner show that a well-deployed, personalized recommendation strategy can increase revenue by up to 300%, conversion rate by 150% and average order value by 50%. See? That’s why Amazon is so crazy about it, and that’s also why you shouldn’t neglect product recommendation either. This might just be the holy grail of personalization, as it takes the experience one step further. Let’s go back to the brick & mortar store example. Imagine going into a store and finding that it’s arranged based on your personal preferences. The products in the window are selected to reflect your taste, the sections you like to shop are in the front of the store, and the specific products that you prefer are on the top of every pile. The equivalent in e-commerce is to personalize every aspect of the store, from which banners the customer sees when they land on your homepage, to the order of product categories, all the way down to the ordering of the products themselves. In fact, 86% of consumers say personalization plays a role in their purchasing decisions (Infosys). Let’s go over what options you have for personalizing the content you show your customers. Amazon looks at my browsing and purchase history, and builds the homepage based on that, to highlight the products that they think are relevant for me. And it doesn’t end on the homepage. They also change the order of the categories based on my personal profile, and even the order of the search results, based on what they think I’m looking for. At the end of the day, I do my shopping online for a reason. I want to save time, get better deals, and be better informed about my purchases. Personalization on this level help me achieve all of the above. While you’re visiting a certain store, you might get some on-site messaging with coupon offers informing you of sales or other offers. Based on Dr. Robert Cialdini’s work, 6 principles of persuasion, different people will respond to different incentives. 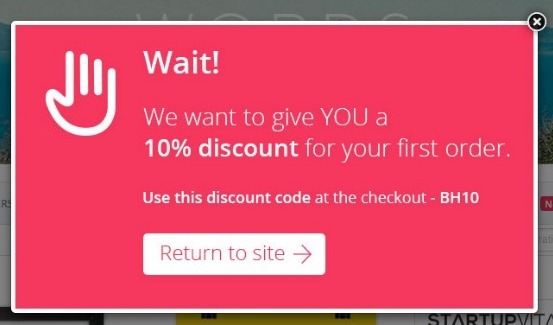 Here is an example of how a pop-up can be used to encourage customers to make purchase. The bottom line here: not only does your messaging need to be well-timed, (offer a coupon when someone enters your site, or just as they are about to leave) but the message’s content also needs to be well-planned. A lot of customers will leave your site without buying, this is the reality of online retail. The question is, what can you do to make sure they come back, and this time – convert them into a customer? A lot us receive emails from e-commerce sites that we visit, but how many of them do we actually open? The key here is to send post-visit emails that really help. Let’s take another example from Amazon. I wanted to buy a Chromebook a while back, and I had gone to Amazon. I searched for Chromebook, and filtered my search by RAM capacity, as I wanted a powerful machine. I didn’t find anything with a good balance of RAM, screen and price, so I left. A few days after, I got an email from Amazon with the subject “Looking for a new Chromebook?” My answer was an immediate “Yes!” and I opened the email. The email was prefaced with my name, and suggested a Chromebook that I might be interested in. Amazon looked at my search and browsing behaviour and saw I didn’t buy anything, so they recommended a product via email that was on pre-order, but really fit my needs. Most people use Google’s search engine, at least once a day. This creates a problem – they expect every search engine to be as “magical” as Google’s is, to know exactly what they’re looking for, even before they press Enter. Even though most e-commerce sites don’t have quite the amount of data on their customers that Google has, there are still many ways to create a personalized search experience for your customers. Much like Google’s search suggestions, Findify’s autocomplete technology changes the suggestions based on the behaviour of customers in your store. You see, most search engines, return “static” results, based on text relevancy. But this approach doesn’t cut it for customers anymore. When searching and browsing your site, customers are implicitly telling you what they are looking for, what their interests are and what are the hottest products right now. Harness this data to dynamically change the order of the search results. Someone is looking for a MacBook, and the new MacBook Air was just announced? Automatically push it up the ranking. Has a user been browsing some high-end products in your store? Make sure other high-end products are showing up at the top. 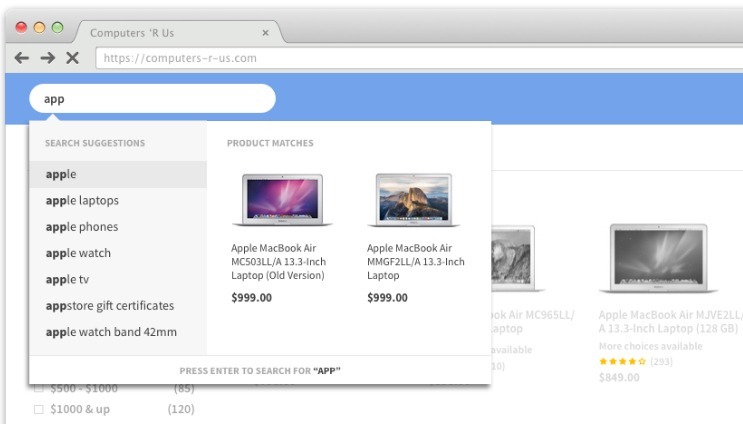 This is how you can show personalized product offers to your customers based on their search histories. 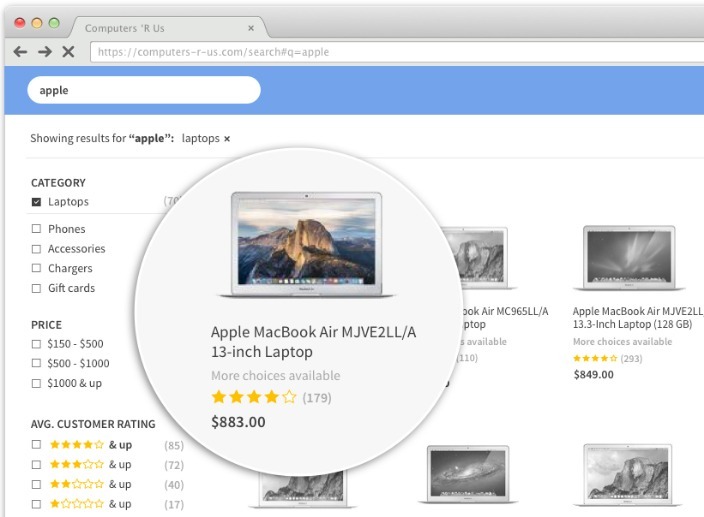 Put products that your customers have already searched for in the first-place spots. Start building personalization techniques into your site, now! E-commerce personalization is the future, and it’s no longer so difficult to achieve. There are so many open source technologies and tools which make personalization more affordable than ever. And it really helps you make every customer feel like they’re getting a unique, tailor-made experience. If you learned from this post and would like to get more great posts about e-commerce marketing and customer loyalty delivered straight to your inbox twice a week, sign up for our newsletter. Let’s keep in touch! Meni is the co-founder and CEO of Findify. He’s a product guy at heart, and has been building them for the past 15 years. He has lived and worked in Tel-Aviv, New York, Tokyo and now Stockholm, loves talking to people and hasn’t shaved since 1997.